Gu Li, thinking nothing of it, played at C2 in response, believing it is a sente move that white must respond (else white loses the bottom left corner). Lee Sil Do immediately plays N18(! ), ignoring the threat. Gu Li, surprised, leans over and looks at the board carefully. He then sighs as he realizes he's just been shot by a dagger out of nowhere. The next set of moves, as demonstrated below, is a one way street, black will have to give up either the group on the top side or the right corner. Black eventually choose to give up the corner. - Move 5, setting up for move 13 at T14. Together with S14 and T16 makes a bulky-five shape. - Move 7, forcing black to chose either living the corner or connecting at M17 to keep the top side group alive. - Move 11 at Q19. White can play S19 later to rob black of a much needed eye at T19. It's a brilliant combination of Tesujis only Lee Sil Do could have thought of. White must have been laughing hard inside or questioning his own sanity while his opponent continued to play a failed ladder. from a Tom forum posting here here. Follow the same drill to go to the next page. the room, playing the first move, and what they had for lunch! There are several pages of pictures. 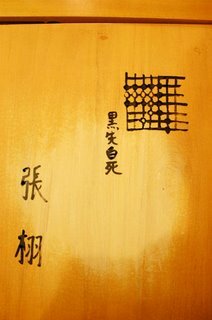 To go the next page, simply scroll down to the bottom of each page and find these Kanji Characters: [下一页] on the last green rectangular banner. There are about 16 pages with pictures intermixed with kifu and others commenting on the game when it was in progress. Apparently the postings were happening live as the game progressed. Pretty neat. 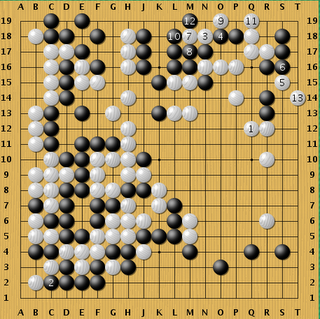 There are some cool pictures showing the actual kifu when the sealed move was revealed at the next day of the 5th game. Kinda remind me of the Hininbo episode between Ogata Sensei and Kawabara Sensei in Hikaru No Go. To retain his Meijin title, Cho U had to win game 5, which he did by resignation, and the next 2 games. Although Cho U is still considered #1 in Japan with high percentage of wins against everyone, he's had a rather below average winning percentage against the current Honinbo, Takao Shinji, who took the Hininbo title from him. Takao is considered Cho U's nemesis by many. In other news, Cho U will be against Lee Sil Dol for the 2006 丰田 cup. He'll be the first Go player from Japan in a long time fighting for an international title. Okay, not everyone has the time or the money to get a teacher. So how the heck can you improve? When there's no teacher, how can you possibly know if you are playing the right moves? Well simple, when it comes to Tsumego, Yose and Counting, there's only one right answer. They are the 'mathematical parts' of Go in which you don't need a teacher's intuition to point you in the right direction. They also happen to be the pillars that make up a strong player. Without them, it's just flower go. You may create a nice advantage in the opening with good fuseki, only to collapse under fighting or flounder facing unreasonable invasions. Time for me to do some Tsumegos.. 87 problems down, 400+ still to go..
2. Rengo or pair-go! This is really a lot of fun, esp if you pair up with a stronger player. You can learn quite a lot by just following along with the flow of the stronger player's moves. At the end of the game, you can review them and see why he played he places he played. Mixed in with your own thought process during the game, the review becomes especially meaningful. Everything is in Chinese but at least you can enjoy the images. It's been over a month since I touched Go. Instead of studying Go, I've been busy studying for job interviews... What joy. After five years of tech start-up rollercoaster, I've decided to get off --- only looking to hop on yet another one. With the number of potential companies, big and small, I decided to seriously study for the interviews this time so I could decide on where to go, instead of going to just some random one that happens to accept me. Studying for job interviews is certainly no picnic. It's no different than studying for the SAT/GRE. Everybody has their own little puzzles or quirky coding questions and each expects you in 45 minutes, convince him/her that you are capable. Questions are thrown at you at will and you must quickly get on the right track while the interviewer quizzically stares at you. As you struggle for a clue, the interviewer just smiles across the table --- savoring the moment of superiority because he knows the answer and you don't. If you do well, all your other qualities will be colored positively; if you do poorly, no references will save you from rejection (and by the way, since nobody ever gives bad references unless you are a complete psycho, they carry very little weight in the decision making process). As an interviewer myself many times, I know it's a charade that gets replayed over and over to fool myself into believing that I can actually tell if the person can do the job within 45 minutes. In reality many a times the person could be a brilliant coder (not saying I am one) yet choke on the simplest of problems, or totally incompetent but just happens to prepare for the right problems, and con its way in. So despite knowing that I am fairly competent, I had to put up with the charade and go back to studying the fundamentals. I went through the old faithful "Programming Pearls", skimmed the "The Art of Computer Programming", Vol 3 and reread the first ~15 pages of each chapter of the classic "Intro to Algorithms" by Cormen et al. I had to memorize all those programming techniques that I've forgotten and practice regurgitating solutions on paper to classic coding problems. It was a painful ordeal but it did pay off well. While I did not get many problems I've exactly prepared for, many were similar enough that I was able to quickly apply the same solution pattern and come up good answers. So does this have anything to do with Go? Sort of. Your ability after all is determined by how you perform at official tournaments where you must play under pressure. You could be the best kibitzer at your local club but choke in tournaments. In a tournament there's no time for you to read out every L&D, some you must know by memory through preparation. And I believe your strength is mostly determined by your preparation of the fundamentals (Tsumego, Yose, and Counting) and conquering your nerves so you don't make mistakes you would never make in a relaxed setting. It's even said that most pros are similar in strength, it's just only a few excel under pressure in tournaments. I've attached the picture below. 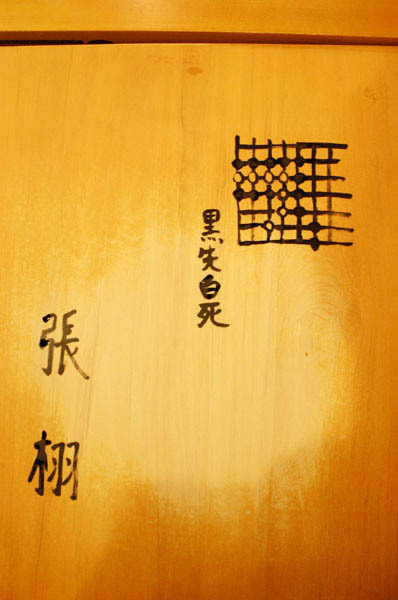 The bottom left is Cho U's name and the top right is the problem, with the four kanji character caption: Black first to kill white. Can you solve the problem?